In GEO 344 - GIS III, Hannah Dorn-Eboh mapped Mount Rainier in Pierce County, Washington. A dormant strato-volcano that has more glacial ice coverage than any other volcano within the continental United States. Mount Rainier has the potential to become one of the most dangerous volcanoes in the world due to its steep topography and significant ice coverage. Geothermal activity can melt the volcano’s ice causing it to mix with dirt or ash creating significant lahars, or volcanically induced mud flows. Historically, lahars have buried communities that lie within their destructive paths. Due to the significant risk, it was decided to create evacuation routes for hospitals that lay within the hazard areas that are determined by elevation and degrees of inclination by the USGS. 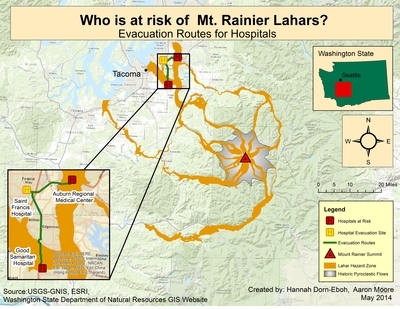 For this map, lahar hazard shapfiles were gathered from the USGS website and hospital data was from ESRI 2010 map data. After the data was collected it was necessary to examine all the hospitals within the study area and identify which ones are at risk of being engulfed by a lahar based on the USGS data. Evacuation routes were created using the network analysis tool in ArcMap to determine the shortest route to the nearest hospital not within the hazard zone.